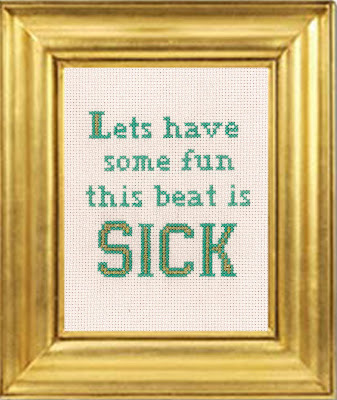 This is a cross stitch I finished last night. Its Lady Gaga lyrics. Because they make for really good quotes. Working with the gold thread is crazy hard. It comes apart and breaks off. It gets a little messy but I must prevail! I have a lot of other projects that will requite this gold thread. This gold frame is a pic from the internet but I have an order of used gold frames coming in to frame new work soon. This particular piece will be available at the Renegade Craft Fair this summer, unless, of course someone wants to buy it before then.